I received a sample pack of Finess in a “bump box” subscription! It was a life changer! At 24 I never thought I would have to worry about leaks, but after having a baby and trying to get back in shape I found myself more self conscious than ever! Finess is amazing and helps stop leaks and build self confidence back up! LIFECHANGING!! Not only do I have an issue with incontinence, I can’t smell. Want to talk about self-conscious?? I was changing underwear several times a day and washing myself. Want to talk about chafed?? SO embarrassed and painful!! I’ve been using this product for two days and I can’t say enough!!! If you have trouble placing it or getting it to stay, don’t give up!! Make sure it’s really dry. I put the fin between two fingers and it’s intuitive. LORD JESUS bless whomever came up with and perfected this product. Thank you thank you thank you!! 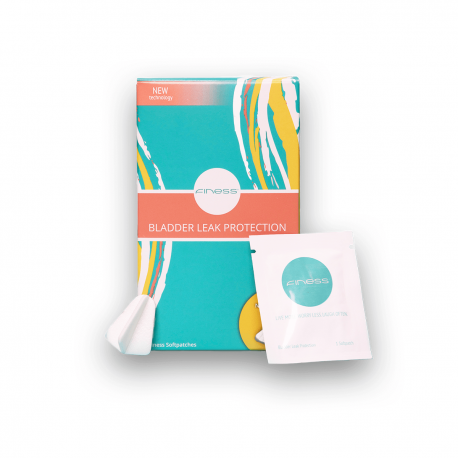 Great product for anyone looking to stop bladder leaks when they exercise. As an active 69 yr old grandma, whose 2 babies were 10 lb & 10 lb. 6 oz, these are a godsend! The women that don’t like ’em can send theirs to me! I spread them out by using them mainly for certain days when I’ll really need them. Yes, like anything, you need to practice putting them on, but it’s not that big a deal. Just change when you use the bathroom. They’ve been a lifesaver for this lady! Takes a bit of practice to get placement perfect, but these work and when it is placed correctly, you can’t even feel it! I was extremely skeptical about the efficacy of this product. I had tried the Impressa product from Poise and it was ok. This product, against all of my doubt and trials, does seem to out preform the Impressa. I think of combination of the 2 would be fool proof but to save cost, which does add up, I think I would choose this product over the other. The only issue I have with it is that if you do squats or spreads for pilates, they leaked for me.I was surprised by how well they worked, so that gives them 4 stars. They beat medication. Give it a try, make sure you place them correctly, good luck! Great for working out, jogging etc. Amazing! Crossfit with no leaks. I only leak when I run or Jump. I used to wear pads, no more pads. Tries poise impressa , it didn’t work. Was very skeptical at first with the idea of these softpatch but they really do work and you don’t even know they are there. I only use them at night time since you have to use a new one each time you go to the bathroom and they are a little pricey to go through 10 a day, lol. I highly recommend them or if you need something for the summer to wear with your bathing suit… they would be perfect. It does work as expected. Who knew something so simple could work so well? The patches are amazing! I only use them when exercising and am thrilled to report that I can jump, lift weights, do burpees, etc. all with no leaking. not for me, but for those who giggle and squirt, works o.k. Very soft, gentle and fairly comfortable. Just not for everyone. This is the best product. I have had issues for years with accidents. I have used all the typical diapers and pads which leaves you wet. These work like a tiny bandage to stop leaks. It helps me make it to the bathroom with plenty of time before an accident. Wow what a difference they made. I have had to bring supplies to events and participated in a half marathon and didn’t have to stop once! They really worked for me! They do help, very soft, and takes that urge away, I guess because it’s pressed against the area. Correctly placed on the first try, totally comfortable, and most importantly it works! I haven’t tried it yet when I’m working out… I tend to sweat a lot “everywhere” when I work out and if it stays attached and working, I’ll be back to give it 5 stars. It is a little cost prohibitive for me to use every day and I’ll probably stick to pads on days when I’m just hanging out close to home. Delighted with this product so far. Upgraded to 5 stars 8/30/16 after two workouts happy to report no slippage and no leaks! Is it too much to say this product is life changing? Extremely surprised how comfortable, so comfortable I don’t even know it’s there. Life is not as enjoyable when you reach your 60’s but now I feel confident whenever I sneeze or cough. Going to place an order again today. I recently purchased Finess after seeing them advertised on Pinterest and love them! I am in involved in a workout group through a local gym and have definitely put them to the test…they’ve never failed me. And a few of the ladies in my group have now purchased them also. Finess Softpatch is very user friendly and very effective to help stop leaks and messes. I was recently dealing with a terrible upper respiratory infection and the coughing fits were constant. Since having a full hysterectomy a few years ago, I’ve noticed differences with my bladder and being able to control it. So with all the coughing I was having to wear liners and even various pads to control the leakage. The Finess Softpatch is so much easier to use! I’m so glad I found these. An excellent product. Quite inventive. Wow! This is a life changer. It fits snug. I can feel it if I sit a certain way, but it is barely noticeable. What I do notice is the lack of having to change my underwear at different intervals through the day and being able to sleep (dry) throughout the night. I can’t imagine why this product is not 5 stars from everyone. I kept the box for about a month prior to trying it. I had convinced myself that it would be uncomfortable and difficult to find the right spot. Wrong! It’s not hard to put on or off and even more importantly – IT WORKS! Now, I use 2 a day – once prior to working and again prior to going to bed at night. I am 55 years old and the mother of 6 adult children most of which were over 8 pounds at birth. Even though I exercise regularly, it took a toll on my body. This product is the silver lining. THANK YOU SO MUCH. My wife says these are the best things ever. She has tried almost everything before these with little success and a great deal of discomfort. She love these and recommends them highly. I am running 5k races again with confidence thanks to Finess. High recommend this product! Perfect for issues with coughs, sneezes, and giggles. Wish there was a way to make them last more than a couple hours. These were a game changer for my workouts. They worked perfectly and controlled the stress incontinence that I would have during hard workouts. I’ve done tae kwon do and kickboxing and used to have to limited my liquid intake for several hours before class. As I got into shape and lost weight, the problem improved but never went away. It was never more than a liner could handle but I was self conscious and worried that others might notice. It also meant I couldn’t go ‘full-out’ like I wanted to. Now I’m doing zumba and loving it but as soon as we start jumping (and we do a lot of it!) I would start to worry and have to dial it down a bit. I took advantage of the sample pack that I read about on a blog and it was a game changer! I was able to do all the jumping jacks etc without any problems. They are comfortable to wear and after a few minutes I’m not really aware that I’m wearing one. Easy to use and worked like a charm! Had to come back and order this after receiving the trial pack. They worked perfectly for me during my workouts. Comfortable and easy to use. I’m able to workout at a high intensity and not have to worry!